From the factory, the 2015-2016 Ford Mustang features bushings in the rear control arm that we found to be less than ideal for putting all the 5.0L coyote’s power to the ground. The factory bushings deflect upon acceleration and steering inputs causing all sorts of handling issues that are less than ideal. In testing, we found that the factory bushings deflect so much that the rear tires can toe inward upon acceleration over 2 degrees! Our Steeda S550 Mustang Rear Lower Control Arm Spherical Bearings eliminates deflection of the factory bushing which is extremely important in any performance application. 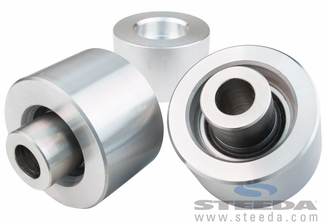 Deflection in the factory bushings can cause all sorts of negative handling affects. Our spherical rear lower control arm will correct understeer under acceleration of your S550. You will notice increased chassis responsiveness upon installing our spherical bearings. If you drag race your GT, EcoBoost or V6 Mustang our rear lower control arm spherical bearings will play a huge role in eliminating deflection, ensuring your tires hook immediately upon acceleration. Our spherical bearings stop your S550 from building negative toe on launch. 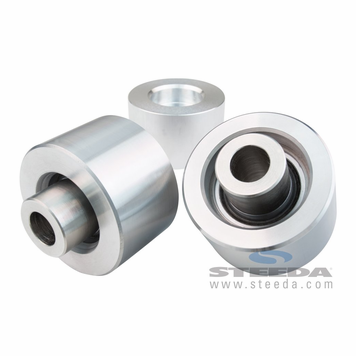 In addition to eliminating deflection and complacence of the factory bushings, our spherical bearings will also eliminate the spring rate of the factory bushing which does not allow the suspension to articulate up and down freely.